Groam House Museum | BE AN ANGEL! As part of our sustainability and fund-raising programme we are looking for Angels. We are asking that each Angel makes a regular standing order or direct debit of just £8.50 per month or £100 per annum for the foreseeable future. Angel contributions go towards running the museum, with a focus on our regularly changing exhibition programme or conserving items in the collections. Just 5 Angels would ensure we can afford interpretation panels for an exhibition. 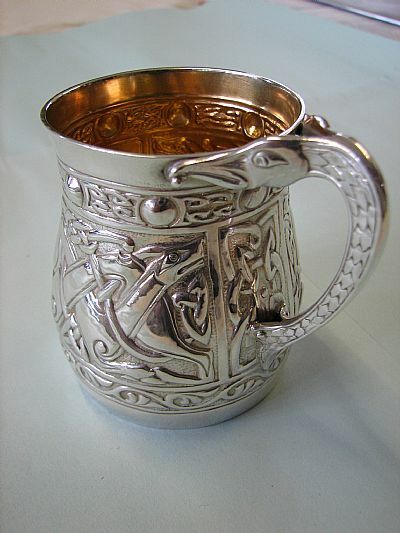 10 Angels would enable us to pay for specialist conservation of objects like this silver mug. As an Angel you will receive updates twice-a-year, while the supported work will also be referred to in our Newsletter.